ECUAD: BGML — When Does 3D Detract Rather Than Add To A Story? When Does 3D Detract Rather Than Add To A Story? At the Emily Carr S3D Centre of Excellence, it’s our job to advocate on the behalf of Content Producers who want to employ S3D and Advanced Imaging Technology. We at the Centre are very bullish and passionate about S3D and all believe that its use enhances a story if placed in the hands of a skillful practitioner. The screening was in the middle of a Monday afternoon, so I was the only one from our group who decided to attend the screening with thoughts that it was important that we were represented at the most atypical of screenings, a 3D documentary from a Japanese filmmaker. 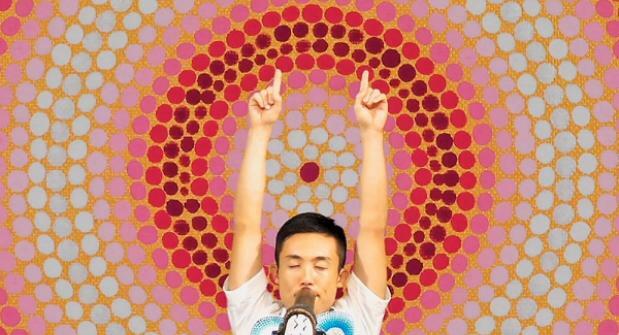 The film is the story of a Japanese Didgeridoo player, Goma, who has an international following. In the film we learn that Goma, whose talents with his Didgeridoo are prodigious (the sounds that he is able to produce from the instrument are truly astonishing) is involved in a car accident that leaves him with short-term memory loss and subject to a series of emotional disturbances. This is a rich subject to mine for a documentary. We see Goma and his band “The Jungle Rhythm Section” performing throughout. In addition, in an attempt to insert another layer to the story, the director has them play in front of a green screen on which video of Goma’s life is displayed. In 2D this would be an interesting directorial choice and an experimental way of chronicling and contextualizing the artist’s history. Unfortunately, however, this diminishes the story in 3D. This is most likely due to the fact that the two eyes are converged on the band and there is divergence on the green screen. More troubling for the eye and brain is the 2D video on the green screen that has been converted. In the genre of documentary, this footage is known as ‘run and gun’, meaning that it was never shot with 3D composition or framing in mind and is something akin to home movies. These two factors, coupled with a large amount of text on screen, created enormous problems for me. I could not fuse the 3D comfortably and was forced to remove my glasses during the sequence. Thus bringing to mind one rule that 3D Filmmaker should never break and that is ‘thou shall not hurt your audience’. The art of storytelling in 3D is merely in its infancy, and all of us producing 3D content have so much to learn. It would be easy to dismiss the Flashback Memories 3D as an experiment that went wrong, but that would be too simplistic and grossly unfair. In fact, whether the director intended it or not, there was one scene that was magical and worked well in 3D, that being the scene in which Goma and his band played in front of the green screen. However, these time still images of paintings that Goma produced (inexplicably after his accident) were shot in native 3D and then projected. This had a surreal immersive quality that only 3D can provide. As evidenced by Wim Wender’s landmark film Pina, http://www.wim-wenders.com/movies/movies_spec/pina/pina.htm documentary is a genre that 3D can and will flourish in. We at the Centre advocate vociferously for its use, but we also know that the filmmaker needs to think carefully before taking their 3D journey. Ultimately Goma is a very interesting character and an extremely talented artist. This does come across in the film and we must laud Mr. Tetsuaki for deciding to employ and display his film in the 3D medium. It is my opinion and that of 3D practitioners that many of the breakthroughs in 3D will not necessarily come from Hollywood but from independent artists. However, whether it’s a big budget movie or independent art film, we must always be conscious of our audience’s comfort and never let the use of 3D detract or hinder the story.